Here’s a recipe for some hot blues. Start with a national headlining act that has roots that go way back in the blues music world. Add a sprinkle of top local talent. Mix, and let smoke. Repeat for a double batch. That’s a winning formula for this weekend’s Anti-Freeze Blues Festival at the Magic Bag in Ferndale. On Friday, the headliner will be Louisiana swamp boogie legend Lazy Lester. Supporting acts include vocalist Tosha Owens; Detroit blues veterans Harmonica Shah and guitarist Jeff Grand, and John Rhoades, one of several younger players making a mark in the Motor City. On Saturday, the Siegel-Schwall Band headlines; following the Howard Glazer Band, which recently released the fine CD “Looking in the Mirror;” young guns Jason Alter and Jason “J-Bone” Bone; and the Chris Canas Band. 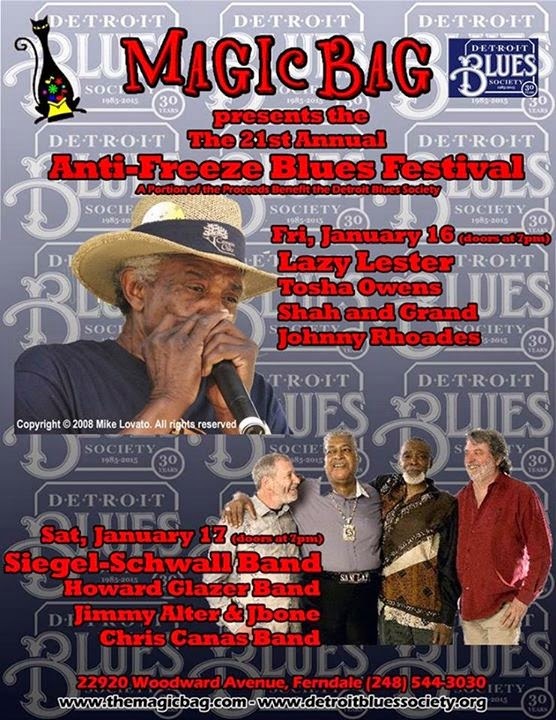 The event is a fundraiser for the Detroit Blues Society. “It’s the first and biggest fundraiser (of the year) for the Detroit Blues Society,” said Steve Soviak, president of the DBS. “It’s very exciting. It doesn’t get much better than Siegel-Schwall and Lazy Lester. “Lazy Lester has been around, almost, since day one. He is 81 years old and was there with Muddy Waters and the whole second generation of Chicago blues guys, although he’s more of a swamp blues guy, with other guys like Slim Harpo. Lay, 79, is also famous for his work with the Paul Butterfield Blues Band as well as lengthy stints backing up Little Walter, and performed with Bob Dylan when he introduced electric-rock at the Newport Folk Festival in 1965. I saw Siegel-Schwall perform at the Magic Bag a few years ago, and it was one of the best shows I’ve seen at that venue. Harmonica player Corky Siegel and guitarist Jim Schwall cut their blues teeth as youngsters performing as the house band at Pepper's Lounge on the south side of Chicago back in the ‘60s. Following the show, Lay told me, “I’m so hot, my toenails are sweating.” That’s how hard this band works. Soviak is also pleased with the supporting acts at this year’s festival, the 21st in the series. General admission tickets are $25 each night. Stop by and say hello to Soviak at the merchandise table. The Detroit Blues Society is celebrating its 30th year and has several special events and a membership drive planned. “It’s an exciting year for us, and we’re starting it off with the Anti-Freeze Blues Festival,” Soviak said. To see a story about the Siegel-Schwall Band by music writer Gary Graff, click here.